How did you get your start as an author? Editor? I wrote and edited for newspapers and literary magazines during high school and college. I had short fiction published in the yearbook of a summer program I attended during high school and more things published in college. All were very rough pieces of work, of course, but one of my short stories published during college was reprinted in a “best of” college fiction collection. After college, I sold film and book reviews to magazines like Filmfax and Midnight Graffiti, and a few articles on film- and game-related topics to other markets. The publishing credits and editing experience, in addition to the classes I’d taught on writing and fantasy literature while working on my Masters, helped me land my first professional editing job, as an assistant in the book department at TSR, Inc. I was initially hired to photocopy manuscripts, mail out review copies, assess unsolicited submissions, write cover copy, and proofread as needed. But this was 1988, and the fiction lines were taking off for TSR. The managing editor, Mary Kirchoff, gave me more substantial assignments very quickly; we were so short-staffed that everyone was being asked to do whatever jobs they could handle. Within a very short amount of time, I was editing major book projects and, soon after that, directing several book lines, including the Forgotten Realms and Ravenloft. TSR really liked to have staffers write exclusively for them. If you were going to write outside of work, they wanted first shot at your services, provided you could prove yourself worthy of a contract. I had been publishing film reviews for various places, but I soon moved that work to Polyhedron; I wrote a regular video review column, titled “Into the Dark,” for Polyhedron for forty or so issues. I designed some game material for the Forgotten Realms and AD&D, second edition. I also submitted proposals for fiction projects and eventually landed one—Crusade, the third novel in the Forgotten Realms Empires Trilogy. Crusade was published in early 1991. The proposals for the Empires books were reviewed blind—with the author’s names taken off the plot proposal and writing sample—so working for TSR wasn’t as much an advantage in landing that assignment as you might think. What challenges do you face as an editor vs. those you face as an author? As a writer, I’m trying to express my ideas, to get my vision for a story down on paper and across to the readers. As an editor, my primary job is to help the writer clarify her or his ideas, to facilitate communication between the writer and the reader. An editor is an agent of the publisher, too, trying to keep the project on schedule and within budget, and something of a stand-in for the reader during the creative process. Editing is a much more complicated job than writing, though I find writing a lot more difficult. What can you tell us about your work on All Flesh Must Be Eaten? I find zombies to be the most interesting monster archetype. They can be used in almost any sort of story effectively. 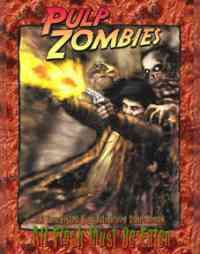 When I heard that Eden Studios was releasing a zombie horror role-playing game, I contacted them and suggested they publish a book of short stories. Since the game didn’t have a specific setting, this was a great opportunity for Eden to publish good zombie fiction rather than fiction constrained by a detailed setting. It took several months of discussion, but Eden eventually decided to give it a try. Best of all, they agreed to creator-copyrighted stories, which is fairly unusual for fiction published in conjunction with a game. Most game-related fiction is published with work-for-hire contracts, which limit or eliminate an author’s creative control. All three of the Eden zombie anthologies were “open call,” meaning anyone could submit to them. This set-up creates more work for the editor—I received around two hundred and fifty submissions for each of the three anthologies, and tried to give each author at least a few sentences of personalized feedback. The extra work paid off, though. Many of the strongest stories in the books were from authors with whom I’d never worked, many of them writers who’d never made a professional sale before. The books have a great balance of veteran and fresh voices. I think that’s a major factor in the success they’ve achieved. The books have sold well for Eden. The anthologies, or stories from them, have been finalists or winners for various awards. About half the works in all three volumes made the honorable mention lists in The Year’s Best Fantasy and Horror, which is unprecedented for fiction releases from a hobby game publisher. You also wrote a tale in Pulp Zombies. What can you tell us about it? Eden occasionally runs “color text” in its All Flesh RPG material—that is, stand-alone fiction selected to set the tone for the game material that follows. When I heard that Eden was working on Pulp Zombies, I pitched an idea for a pulp-style novella featuring a mystery man hero called the Corpse. I’d created the character some years back, and the story—“The Night Chicago Died”—was one for which I’d been making notes for some time. It worked out well. Not only did I finally get to use the Corpse, but I worked in the protagonist from the Ebonacht books, Edward Janus, who pops up in a lot of my fiction. The novella plays up the apocalyptic tone of some of the grimmer 1930s pulps—like The Spider or the Purple Empire storyline from Operator 5—and adds in a protagonist conscious of the amoral and sometimes immoral nature of his war against crime. That subverts the pulp conventions, since the story doesn’t excuse the horrible things the hero does simply because he’s doing them to the bad guys. The novella made the honorable mention list in the Year’s Best Horror and Fantasy and the final ballot for the Origins Award. I’ve discussed a graphic novel sequel to the story and am currently writing “The Crooked Smile Killers,” which is a prose prequel. “Crooked Smile Killers” will run some time in 2007, I think, in one of two or three markets that have expressed an interest in it. What can you tell us about your work on Ravenloft? 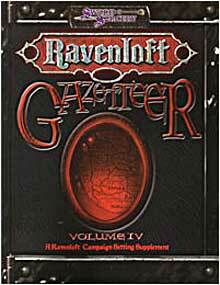 I was primary fiction editor for Ravenloft at the time the book line launched. I landed the assignment due to my interest in horror and dark fantasy, and my knowledge of the original Ravenloft role-playing adventures. I edited the first half-dozen or so novels and ended up writing the second release, Knight of the Black Rose. That wasn’t the original plan. Another author had been tapped to write Knight, but he left the project shortly after he signed the contracts. The managing editor and I auditioned several other writers, but all the proposals they submitted centered on a radical redefinition of Lord Soth’s character—and redefining Soth was something we didn’t want to do. Finally, the managing editor called me to her office and suggested I write the book, since we were having such a hard time finding someone who wanted to tell a story emphasizing and exploring, but not changing Soth’s identity. Writing the book myself was not my first choice, but it seems to have turned out for the best. A change of management in the TSR book division meant that all the lines were broken up and assigned to various editors after a certain point. Carnival of Fear was my last book as Ravenloft line editor, though I edited one more Christie Golden Ravenloft novel a year or so after Carnival. In 1992 I resigned my staff position. For two years after that, I continued working as a contract employee, editing some novels and anthologies, and writing stories and novels. I pursued limited writing and editing gigs with other companies, but the plan was for me to write mainly for TSR, at least for a few years. My first major writing assignment as a fulltime freelancer was a Ravenloft trilogy, but I ended up withdrawing the first book, The Screaming Tower, after the initial editorial review phase. It was a problem of creative vision. I had contracted to write the book one way, with the previous head of the book division, and the new guy saw the Ravenloft line very differently. There was no way we were going to make The Screaming Tower work for both of us, so I withdrew it and the rest of the Ebonacht Trilogy. Shortly thereafter, I stopped working for TSR altogether. For the next few years, my main interaction with TSR was legal wrangling over the Ebonacht Trilogy. Thankfully, Wizards of the Coast bought TSR and management of the book division changed again. Shortly after the buyout, Peter Adkison talked to me about the situation with The Screaming Tower and suggested some very positive possible resolutions. WotC offered to contract me again for the trilogy, with an eye toward publishing the books as I had originally envisioned them. By that time, though, I’d published some stories using Edward Janus, the trilogy’s protagonist, and would have had a hard time limiting him to use in the Ravenloft setting. So I decided to develop the Ebonacht material elsewhere, but also accepted WotC’s invitation to write in the Ravenloft world again. That’s how I ended up working on Spectre of the Black Rose. Heroes of Light and the Ravenloft Gazetteer IV from Sword & Sorcery Studios—what involvement did you have with those? Jackie Cassada and Nicky Rea, the Ravenloft game line coordinators for White Wolf’s Sword & Sorcery imprint, asked me to write some game material connected to my Ravenloft fiction. For Heroes of Light, I wrote game stats for the Wanderers, updating them from the end of Spectre of the Black Rose. That was a lot of fun. For the fourth gazetteer, Veronica Whitney-Robinson and I wrote the section updating the domain of Sithicus. There was some controversy shortly after Gazetteer IV was released, because some of the Sithicus material I’d written was changed in the editing process—needlessly, in my opinion, and to the detriment of the project. The people serving as official editors and line editors for Sword & Sorcery had allowed other people access to the manuscripts, and changes were made outside of the review process that had been described to me at the project’s start. I found out about the changes after the book had gone to press, and that led to some rather heated exchanges on a Ravenloft-related message board. I’ve got no gripe with the official Sword & Sorcery editors. Once they were alerted to the problems, they apologized and admitted things hadn’t run as they should have, that some people had overstepped the review duties they’d been asked to perform. The problems could have been avoided quite easily. Had I been allowed some input on the changes—had someone pointed out the problems they saw in the manuscript and discussed potential changes—I could have pointed out where their suggested fixes were actually inserting mistakes. Better solutions could have been hammered out that answered everyone’s concerns. That didn’t happen, though that’s no surprise in a work-for-hire project. That contract structure regularly leads to intrusive tinkering from multiple reviewers and the marginalization of the author from the creative process in the revision and production stages. What challenges do you face when writing for established settings such as Ravenloft or Forgotten Realms? At its worst, writing in a company-controlled shared world means accepting artificial and potentially story-deadening constraints based upon marketing and other non-narrative concerns. It can also mean layers of interference unheard of with creator-copyrighted projects, or even shared world projects like Wild Cards or Thieves’ World that are essentially creator-controlled. Not only are you working with an editor, but often continuity managers and other people who might not be as interested in the creation of good fiction as they are the production of marketing-focused material for the brand. It’s a creative control issue, and the contracts most often used with shared world fiction require the author to give up a lot of that control. That’s shared world writing at its worst, but that’s not to say that there aren’t terrific shared world books out there or that writers can’t do great work in a shared world. Some writers get away with telling precisely the stories they want to tell within a shared world because they know how to maneuver around the obstacles. Sometimes all the stars align and the various people reviewing the work turn out to be interested in good fiction. For the books and short stories I wrote in the Realms and Ravenloft lines—up until the Ebonacht Trilogy, anyway—I was quite fortunate and had very little unreasonable interference. I’ve had very good experiences with some other shared world gigs, too, particularly the short fiction and comic book story I wrote connected to White Wolf’s World of Darkness. And working in a shared world adds a level of community to writing that’s difficult to find elsewhere. It’s a lot of fun to sit around a table with talented people like R.A. Salvatore and Elaine Cunningham and Ed Greenwood and kick around Realms ideas. But I’ve had enough bad experiences with shared world work that I’m very cautious about the assignments I accept these days. I need to know going in that there’s a specific story I want to tell and that the publisher and owner of the shared world IP want me to tell the story the way I hope to tell it. Even then, I push for as much creative control as possible. Having written and edited fantasy, horror, superheroes, and more, do you have a favorite genre? Why or why not? The things I’ve been writing of late tend to be hybrids—horror-tinged SF, dark fantasy rather than traditional sword & sorcery—and directed by theme or character. The only time I really give a lot of thought to genre is when I’m trying to subvert the expectations, as I tried to do in the superhero story “Fanboy” or the pulp hero mystery man tale “The Night Chicago Died.” I know I’ve done my work with stories like those when readers well versed in the genre conventions tell me that the endings were unexpected. As an editor, and as a reader, I love to see stories prompted by passion and vision. Genre is unimportant. Do you prefer working on novels, games, or comic books? Why? All three are very different artistic forms, so which I prefer for a particular story is determined by the story itself. There are tales that work well in prose, but don’t lend themselves to comics, and so on. For the most part, I favor prose. It’s the form with which I’m most comfortable. But I’ve come across story ideas that I know instantly will be most effectively conveyed through an illustrated form. Of course, that requires I find a collaborator, since I don’t have much talent in drawing. And the moment you bring another person into the storytelling process, it complicates things. Will this artist understand what I’m trying to convey? Will the artist add to the tale rather than just transcribe it to pictures? You want that—an artist so in synch with your vision for the story that you both add things to the telling. When you find the right artist for a particular story, it’s terrific. Brett Barkley, who illustrated “Lost Loves” for the Moonstone Monsters: Demons anthology, understood the script and nailed precisely what I was after, particularly with the first few pages of the piece. He suggested a number of background bits that really helped give the setting depth. What advice do you have for hopeful authors? Write stories you care about. That way, even if they’re never published, you’ve created something you value. Be persistent. It takes equal parts talent, luck, and persistence to get into print, and you’re most likely going to receive a lot of rejections before you get anything published. Even after you get something published, you’re going to keep getting rejections. They’re just more likely to be rejection letters with your name spelled correctly. Finally, learn the business of publishing. Read up on contracts. The terms under which you create or publish your work can have a profound impact upon the work itself. I’m writing several short stories for various markets, as well as a Ravenloft article for Dragon and a few other short pieces. I’m in talks with a publisher about a collection of my short fiction for late 2007. The working title for the collection is Heresies and Superstitions. I’m very excited about that. I recently had a script accepted for an anthology comic and am involved in some other comics-related discussions. I’m working on proposals for a few larger projects, both fiction and nonfiction, that I can’t really discuss yet. On the editorial front, I’m wrapping up work on Astounding Hero Tales, an anthology of pulp-style fiction of various genres. AHT contains original, previously unpublished stories by pulp legends Hugh B. Cave and Lester Dent, as well as neo-pulp scribes Will Murray, Robert Weinberg, Darrell Schweitzer, and a number of other really talented writers. That book has been several years in the making; I’m pleased it will see print soon. Eden Studios has expressed an interest in a “best of” collection of stories from the All Flesh anthologies and perhaps even a fourth original volume; both would be a lot of fun to put together. Do you have any favorite horror or dark fantasy tales that you would recommend everyone read? I could list hundreds. Pynchon’s Crying of Lot 49. Cornell Woolrich’s Night Has a Thousand Eyes, which is a stunning horror-mystery hybrid. Chesterton’s The Man Who Was Thursday. Jonathan Carroll’s The Land of Laughs. Moorcock’s The War Hound and the World’s Pain. Clark Ashton Smith’s short fiction. Jean Ray’s Malpertuis and his short stories “The Tenebrous Alley” and “The Mainz Psalter.” Robert Chambers’ The King in Yellow—the first set of linked stories, anyway. Joe Lansdale’s By Bizarre Hands. Kim Newman. Potocki’s The Manuscript Found in Saragossa. Hogg’s Confessions of a Justified Sinner. Ambrose Bierce. William Hope Hodgson. Dunsany. Shiel. Ellison’s Deathbird Stories. The Fantômas series of French proto-pulp novels. Mervyn Peake. There’s an incredible amount of good stuff out there. Both the annual Best New Horror and Year’s Best Horror and Fantasy anthologies are very useful guides to newer works. The two volumes Stephen Jones and Kim Newman edited—Horror: 100 Best Books and Horror: Another 100 Best Books—are great places to learn about older horror and dark fantasy works worthy of your attention. For more information about James’ writing and editing, visit his website, JamesLowder.com.